California metal garage kits and steel arch buildings for sale. 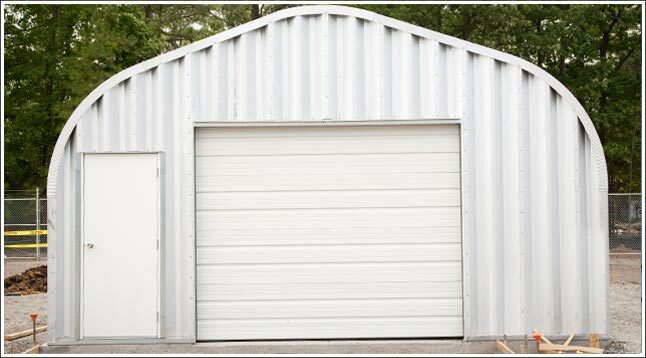 Metal garage kits and steel arch buildings custom manufactured and designed in California. Steel arch metal garage kits in California are made with 14 - 22 gauge galvalume steel and bolted down to a cement foundation to far exceed all the requirements in California’s manufactured building, commercial building and residential building codes. California garage kits are solid steel structures that help protect your contents from earthquakes and land slides that often occur along the San Andreas fault line due to tremors and mud slides. Californians widely use Metal Building Kings® galvalume steel buildings to protect valuables, equipment and businesses from wild fires as there is no wood or fabric in the garage kits and they resist collapse due to heavy roof loads. Chooose from 4 different models that range from 13' wide to 100 feet wide, 10' to 24 feet high and unlimited in length. The entire California garage is manufactured in heavy 14 - 22 gauge 80,000ksi tensile yield carbon steel. Other less expensive garage kits just have heavy gauge steel in the tubular framing and not the walls and roof where the steel is very thin. This renders the structure vulnerable to heavy mud slide loads and earthquakes where quick ground shifting can loosen the framing system. Imagine running a tractor into this type of building. You would get dents in the walls unlike the steel 14 gauge walls of an arch building system where the equipment would suffer more damage than the building. To keep your California steel arch garage secure we provide the best door systems to keep with the integrity of our surrounding structure. Walk through doors are available in re-assembled commercial wind rated to 160mph. Overhead roll up systems are built into your end wall and operated electronically. They are manufactured in 16 - 26 gauge steel and wind resistant top to 160 mph. You can choose from bi-fold, standard sectional or sliding garage doors too. Choose from exterior colors of galvalume silver to earthy colors like Fern Green and Limestone. The AkzoNobel Ceram-A-Star® 1050 coating systems which is top manufacture of synthetic resins, and paint finishes last decades on your California metal garage free from rust and corrosion and virtually maintenance free. California garages come with skylights because of the amount of annual sun the state has. Skylights are like replacing a panel and are water tight and are certified for high wind velocity to prevent breaking or cracks from flying objects. Skylights are a great way to increase energy efficiency by adding natural light into top and sides of the garage. Metal Building Kings® locations in California distribute custom manufactured and designed buildings throughout the Golden State from Los Angeles, San Diego, San Jose, San Fransisco, Fresno, Sacramento, Long Beach, Oakland, Bakersfield, Anaheim, and Santa Ana to its 38.8 million residents in all 58 counties. Our steel structures are manufactured to meet the toughest certification standards that apply to California building codes especially in Southern California, Los Angeles, and along the the San Andreas fault line areas where seismic building codes are enforced. California does not mandate a statewide state building code for either residential or commercial structures, but it does recommend adoption of the 2003 IBC and 2000 IRC for municipalities and counties. With a steel arch building there is little chance that horizontal forces or lateral loads from sudden terra firma displacement in an earthquake will cause building collapse.